With more than a decade of experience in marketing, ranking from pay-per-click to direct mail, I've seen a lot of failures and far more successes when it comes to marketing. Never work alone. The most creative ideas come from working with other creative people. Don't feel like you need to have all the answers or great ideas. You may start with an idea, but an open dialog with creative individuals will make it better. Don't sell on price. I've seen so many marketers fail because they sell on price alone. This leads to a discounting war, lower profitability, and often bankruptcy. Rather, focus on creating so much value that the perception of price becomes insignificant. Create value after the sale. As marketers, it's our job to understand our market segment and build relationships, not dump people off at the front door of our store and walk away. Focus as much of your energy on building relationships with customers as you do prospects. Integrated Marketing Works Best. You can't rely on one form of marketing to carry you to success. It's okay to generate most of your leads or sales through PPC marketing if you will but what happens when that dries out? Use multiple media sources to meet your goals. Now what do you tweet about? You do a couple of tweets and you read others tweet – but you just don't get it. 9. Sparingly link to your own blog posts. Don't over promote yourself. Final tip: Don't sell in social media. Don't yell on social media. The key thing to remember is that it's about listening first – and engaging. Even If You're A Marketing Novice"
On Wednesday, August 31st, you're invited to a free 90-minute webinar (or telephone seminar) and hear Steve Harrison, publisher of Reporter Connection, Book Marketing Update and Radio-TV Interview Report (RTIR) interview author Peggy McColl about the simple blueprint she's developed to quickly make many books bestsellers at practically zero cost. You'll hear how Peggy catapulted her own book to the Amazon, Barnes & Noble and New York Times Bestseller Lists. Peggy's ingenious yet simple, five-step blueprint any author can use to make their book a bestseller at almost no cost. How she's used the formula to make numerous books bestsellers and how one author usedherformula to sell 6,828 ebooks for $27 each without spending a dime on advertising -- yes, that's $184,256.00 in sales! Why her method works for all types of books, fiction or non-fiction, regardless of subject including self-published, POD, ebooks, newly-published or even those that have been out for years. How Peggy uses blogs and social media to sell books including how she got coverage on the Huffington Post as well as why you need a Facebook page just for your book (and how to use it effectively). Case histories of several authors who've hit the bestseller lists using this approach. Big mistakes almost all publishers make selling books on Amazon. P.S. FREE Webinar (or Telephone Seminar, if you can't be near a computer) -- There's no cost to participate in this webinar (or telephone seminar) except your normal long distance charges (same as you'd pay to call Aunt Edna in Toledo). I just got back from the BlogHer11 conference in San Diego, which was my second time attending the conference. But there is no way that I can afford to attend blogging conferences more than every so often. But the good thing about conferences sponsored by BlogHer is that they live blog all the sessions and post them online. So even though you were not there, you can still get all the information that was presented - for FREE! Change Yourself - 'Til Blog Do Us Part? Change Yourself | Unplug, Unfriend, Unfollow, Unwind: Is That Sacrilege? Change the World | Owning Your Beauty: If We Change the Conversation, Can We Change the Culture? Closing Keynote: Women in the Media. Women Making Media. Stay tuned as I tell you about our other adventures in San Diego in the next installment in my series "BlogHer11: Blogging by the Bay". The Embassy Suites sponsored 3 nights of my hotel stay for BlogHer11 at the Embassy Suites Hotel San Diego Bay. Great News! We're having the END OF THE SEASON sale on some of my most popular PR & Social Media products and services (Up to 50% off!) So there couldn't be a better time to stock up! This sale only lasts for 9 days, and there is limited availability for some, so do NOT miss your chance to grab them now! You've got a lot of great ones to choose from! "How to Put Together a Winning Branding Strategy"
The nuts and bolts of putting together a Winning Marketing/Communications Strategy / Strategy for your ministry that will explode your membership and excite your congregation. While are mp3 are just teasers, this is a no-holds barred! How to use email marketing techniques to expand your "customer evangelists." This audio MP3 will give you the who, what, why and how to do it. Comes with a Powerpoint Presentation and worksheets. 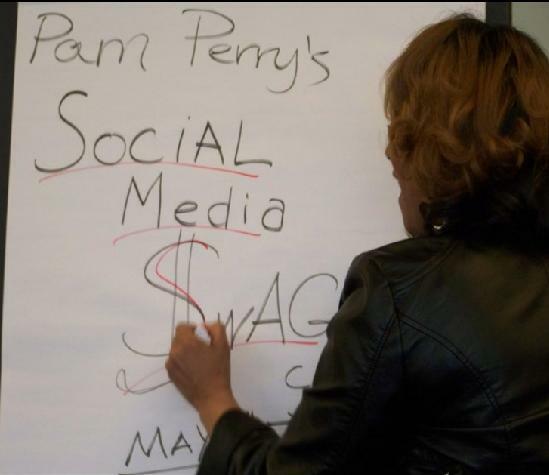 In this teleseminar you'll learn how to: Infuse traditional PR methods with new social media tools to rise above the noise in a crowded marketplace. Step by step guide with examples. It's content-rich and very affordable! Here is everything you need to know before you embark on your book campaign. All secrets revealed to give you the "skinny" on what it takes. And within a modest budget too. My best selling mp3! Everything you need to market your book, grow your business and brand your ministry using the secrets these authors have learned over the years about partnerships, PR and promotion. Hear insider secrets from seasoned Publicist and Best-Selling Author - here's what you'll get: · An insider's grasp of how major publishers work · The facts you need on how to secure an agent · Hard-won wisdom on self-publishing & more... Many teleseminar programs cost over $1497- this one lays it all out at a fraction of the cost! You get all of the digital products (and more) listed above at 50% off! Register now and get The Whole Enchilada above FREE (some already come with the program- but some don't!) PLUS, you can get started right now with the most generous payment plan EVER! There are just 5 slots available, so don't wait! I have designed these specials so that you can get finish out this year STRONG and get a leg up on creating a successful business/ministry in 2012. You deserve to succeed - summer is over, let's get down to business! ===> Go to http://www.pamperryonlinepr.com NOW to grab these amazing deals! P.S. Note, at checkout you will receive the 50% discounts. This sale is only good until Wednesday, August 31, 2011. (sale ends at Midnight EST). Shop for your success PR Pro products and services now!